Sales and streaming of multi-channel music in the finest quality. Surroundmusic.one is a non-profit web shop supporting the artists. The purpose of Surroundmusic.one is to support artists who want to release their music in surround sound and to generally make sales & streaming of 5.1 music more common. Support the artists & buy digital downloads! Digital downloads from surroundmusic.one come as a zip file containing multichannel FLAC files and artwork; Why? The forum with most surround interested people: quadraphonicquad.com have been asked: ‘How many of you can play multichannel FLAC files directly?’ 50 out of 52 who have answered CAN play FLAC files directly! 96%! (See more about that and their gear here) – This is another good argument for more artists releasing their surround mixes as digital downloads! A few purchases cause problems during download where it is interrupted. What can be done then? Try using browsers who can resume a download, like Google Chrome or Firefox or wait some time and try again. Or programs like Flashget can help. Surroundmusic.one is placed in EU and most files are hosted there to keep the expenses down. This can sometime give problems downloading these large zip-files from countries far from EU. Some of the largest files are hosted on U.S. servers to give more smooth downloads to US customers. Why is the music we listen to now, inferior in quality to the CD format from 1980? 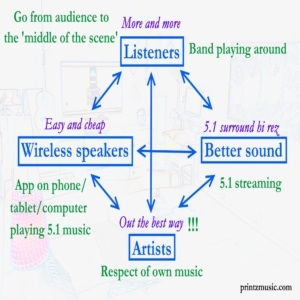 Do so few people listen to music in 5.1 surround because not a lot is released?? That is going to change now! Wireless speakers systems for surround music has now been made. This can make surround music a lot more available! More and more bands see the sense in releasing their music in the best quality also! If higher quality of music was available in a quality better than mp3 and CD quality will you choose that? Half of them answered yes! So if it is easy to stream and buy high resolution music then a lot more will listen to it. It is likely that more and more bands will insist coming out in surround sound! ReUpmix (Remix Upmix) from stereo tracks to 4.1 or 5.1 surroundsound. For songs without the original instrument and/or vocal tracks for making a proper surround mix. Here ReUpmix works fine! Give it a listen and see more here. Surroundmusic.one is a part of Printz Music studio: Production of 5.1 mixes out of all tracks/instruments made for a stereo mix/album. 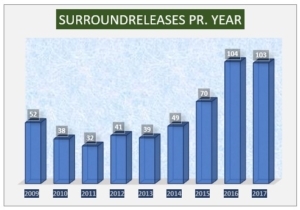 Printz Music is working for the growth of surround releases.